To ensure that within six months, 75 to 100 per cent of patients in the Cardiology Ward of Blacktown Hospital have an accurate medication reconciliation within 24 hours of admission. Provides an accurate record of patients’ medication history. Improves the health outcomes and safety of patients. Reduces the risk of errors in prescribing medication. Improves the quality of care delivered to patients. Improves staff satisfaction and morale in the hospital setting. Enhances the skills and knowledge of staff in medication reconciliation. Maximises the use of electronic medication systems. Medication reconciliation ensures the best possible medication history of patients is recorded on admission, prior to transfer of care between health settings and on discharge from hospital. It has the potential to prevent medication errors and discrepancies, which can improve medication safety, minimise length of hospital stay and reduce the risk of re-admission. In February 2017, electronic medication systems were introduced to Blacktown Hospital. This system was expected to improve medication reconciliation and safety, however errors continued to occur. Not all patients had a best possible medication history taken on admission or prior to transfer of care between wards, as expected following implementation of the new system. An audit conducted in May 2017 showed that only 10 per cent of patients in the Cardiology Ward of Blacktown Hospital had a correct medication history included in their medical record. This led to medication errors, such as incorrect doses and strengths, and omitted medications. It was identified that the electronic medication system did not flag non-reconciled medications, which allowed medical teams to prescribe medications that had not initially been reconciled. As a result, only two out of 20 patients had correct medications prescribed on discharge (Figure 1). Diagnostic workshops were undertaken and the existing medication reconciliation process mapped for patients in the pilot ward. These workshops used Clinical Practice Methodology to identify primary and secondary causes of the problem, which included not prioritising medication reconciliation as an important procedure and a lack of communication between teams. A new patient medication reconciliation form was developed and implemented, to simplify the medication list that patients need to complete on arrival to the ward. Once patients complete the form, the pharmacist or medical team double-checks the medication history with the patient and another source (such as a doctor’s letter, webster pack or community pharmacy) then uploads the medication list into the electronic medication system. This process is a bridge between the old paper Medication Management Plan (MMP) charts, and the new electronic system. An interview is conducted between patients and a staff member from the pharmacy or medical team within 24 hours of admission, to ensure the best possible medication history is captured as early as possible and to involve patients in their MMP. Regular face-to-face medication reconciliation training was provided to all teams on how to record patients’ medication history in the electronic medication system. These training sessions were provided to advanced trainees, registrars, medical interns and nursing staff at the start of each term at various shift times, both in groups and individually. Ongoing audits were conducted to measure use of the new medication reconciliation form and the quality of medication reconciliation captured by staff. Articles on the project were published in newsletters and journals to recognise the hard work of staff involved in the project and set a good example to other wards. Patient engagement during medication reconciliation increased from 36 per cent in 2014 to 100 per cent in July 2017. Use of the new patient medication reconciliation form increased from 50 per cent within one month of implementation to 100 per cent within two months of implementation. 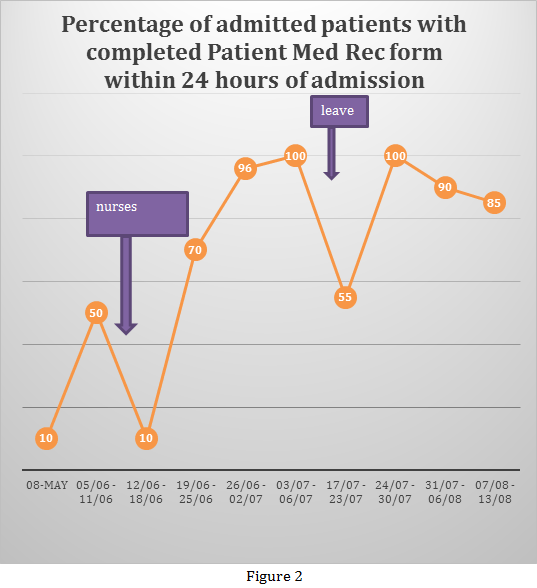 The number of admitted patients with a completed medication reconciliation form within 24 hours of admission increased from 50 per cent within one month of implementation to 100 per cent within two months of implementation (Figure 2). The number of patients with an accurate medication list on discharge increased from 50 per cent within one month of implementation, to 100 per cent within two months of implementation. 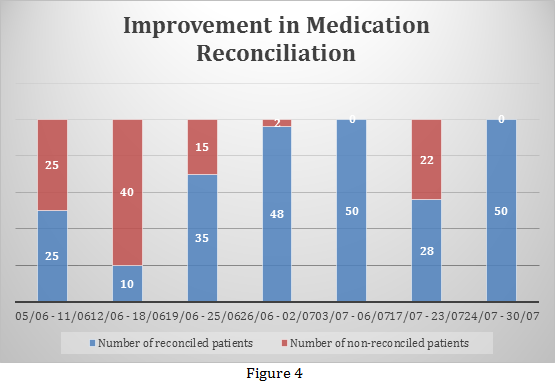 The rate of accurate medication reconciliation increased from 50 per cent within one month of implementation to 100 per cent within two months of implementation (Figure 4). All patients were actively involved in their medication management through interviews with staff within 24 hours of admission (48 hours during weekends). 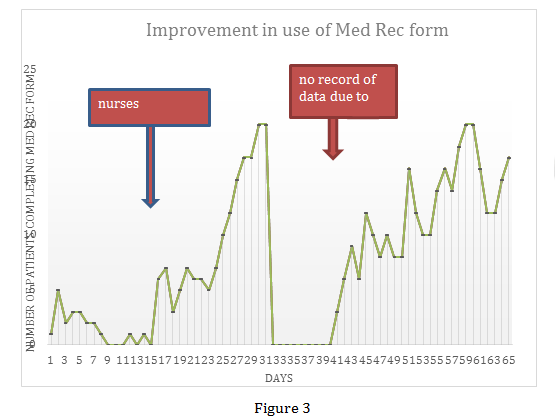 Training of teams improved the uptake of the new medication reconciliation form by nursing staff and improved documentation of initial medication histories in the electronic medication system. 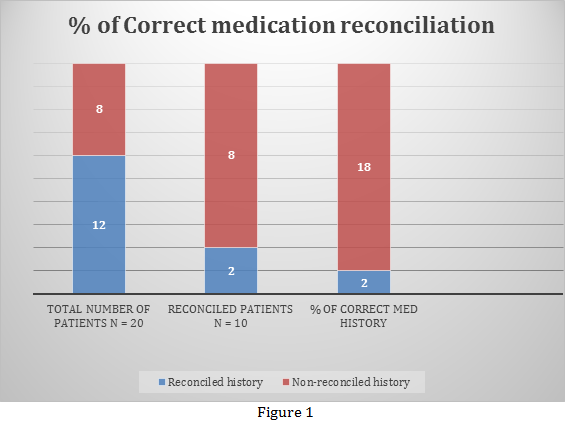 Compliance in providing and completing the new form, medication reconciliation within 24 hours of admission and providing accurate medication lists on discharge were all measured on a daily basis (Figure 3). Improving the quality of patient care through medication safety should be the number one consideration throughout the project. There were many challenges, such as false thinking that medication reconciliation is a pharmacist’s job and not a priority for clinical staff. No reconciliation took place when the project leader was on leave, which indicates that the quality improvements are not yet embedded in daily practice. American Pharmacists Association and American Society of Health-System Pharmacists. Improving Care Transitions: Optimising Medication Reconciliation. Washington DC, USA: American Pharmacists Association; 2012. The Society of Hospital Pharmacists of Australia (SHPA). SHPA Medicines in Focus: Background Material – Medication Reconciliation. Collingwood, Victoria: SHPA; 2012.